Identifying reliable, prospective vendors is the first step, and CAMs within a management company are able to share their infor-mation. “We have developed a vendor list over the years with firms that have demonstrated their work and track record,” shares Lisa Christian, CAM with Don Asher and Associates, Inc. “What’s key for us is quality work and a timely response. Typically, we’ll only try out a new vendor at a board’s request, but we are approached at trade shows, and if we like what we read, we’ll check references. In addition to vendors used in the past, Masch suggests checking vendors who are members of associations such as CAI (who are experienced with association work), vendors referred by the manufacturer or distributor of the products to be used, and vendors recommended by other contractors. 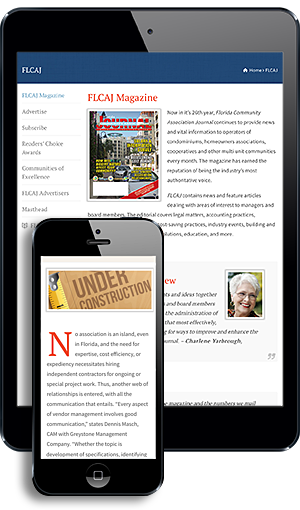 Another great association source is Florida Community Association Professionals (FCAP). Their CASP-designated members are vetted, experienced, and qualified service providers for association work. Why was the vendor selected to participate in bidding? Was the work they performed similar to your project? Was the work performed in an orderly fashion and within the expected time constraints? Why was this vendor selected? What problems surfaced, and how were they resolved? “The timing and promptness of a contractor is important for both routine maintenance and special projects,” Evans explains. “When does the board expect the work to start and be done? What is the protocol for weather delays, and does the contractor work on other waiting projects before embarking on yours? Some homeowners may object to crews starting early or working late, but the contractor may need to do that to stay on schedule. If those things are not stated, they can snowball and cause contention. Once these details are ironed out, they should be publicized to the membership so they have a general understanding of what to expect.” “The manager should think through how she would feel about someone working in her home, and if she doesn’t have that experience, then talk to someone who does. Associa maintenance is trained to use booties in homes and bring their own towel to dry their hands. Working around windows is often a big issue if people haven’t been notified. Usually, a contractor routinely addresses these types of things; you can tell from their response if they think you’re too picky. If they’re huffing and puffing, this isn’t their cup of tea,” Evans advises.